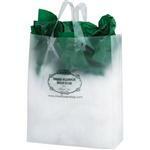 Frosted Die Cut Custom Plastic Bags Ink Imprinted 12 x 15 x 3 Gusset with your logo. Frosted 3 mil. high density polyethylene die cut handle bag. 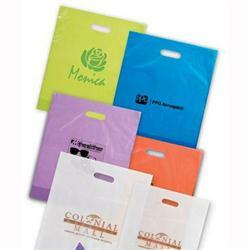 Take these colorful totes to your next promotional tradeshow or retail outlet event. Comes in Blue, Lavender, Tangerine, Lime, Clear, and Pink. Available Colors: Blue, Lavender, Tangerine, Lime, Clear, and Pink. Dimensions: 12" wide x 15" high x 3" bottom gusset. Typical Imprint Area(s): Second color run charge add $.15 per bag. Need 1/2" separation between colors for best results. Available Imprint Options: 8" wide x 8" high. 1 Case = 500 bags = 18lbs.